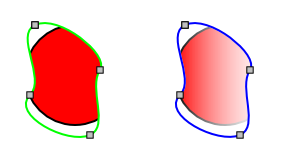 Simple examples of clipping (top) and masking (bottom). 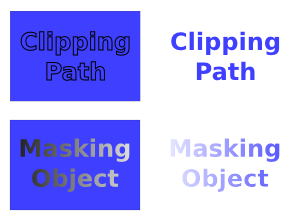 The left column shows the text that serves as the clipping path and the text for masking, both overlaying blue rectangles that are the targets of the clipping and masking. In the right column are the results of the clipping and masking. A clipped or masked object can be edited (transformed, style changed, nodes edited, etc.) while clipped or masked. Objects within a clipped or masked Group can also be moved relative to the clipping path or masking object if the Group is entered. Demonstrating the editing of a clip path (left) and a mask path (right). New in v0.48: By default, Inkscape will clip or mask each object separately if several objects are selected. In the Clippaths and masks section of the Inkscape Preferences dialog you can change this to have Inkscape first group the objects before applying a single clip or mask.